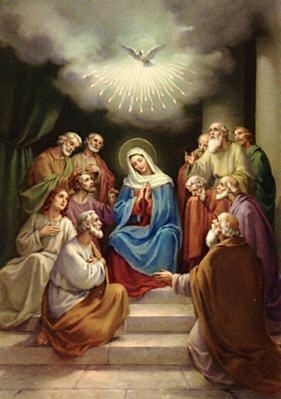 O God, who didst instruct the hearts of the faithful by the light of thy Holy Spirit, grant us, in the same Spirit, to relish what is right, and ever to rejoice in His consolations: through Jesus Christ. Amen. V. Loquebantur variis linguis Apostoli, Alleluia. Let thy celestial grace command. And sacred unction from above. Let not our feet to evil slide. V. The Apostles spoke in various tongues, Alleluia. R. The wonders of God, Alleluia. Come fire our hearts with love. Whose faith aspires to thee. The seven gifts of thy Spirit. And endless joys inherit. Amen.